McKinlays are pleased to offer for sale this well presented two bedroom first floor apartment located one road back from the cliff top. It has modern fitted kitchen with appliances, modern family bathroom plus master with en-suite shower room. It has a large 18′ plus southerly aspect lounge / diner and the property has a light and airy feel. Ideally situated between the cliff top and the grove it makes for a perfect first time purchase, home away from home, or a buy to let opportunity. 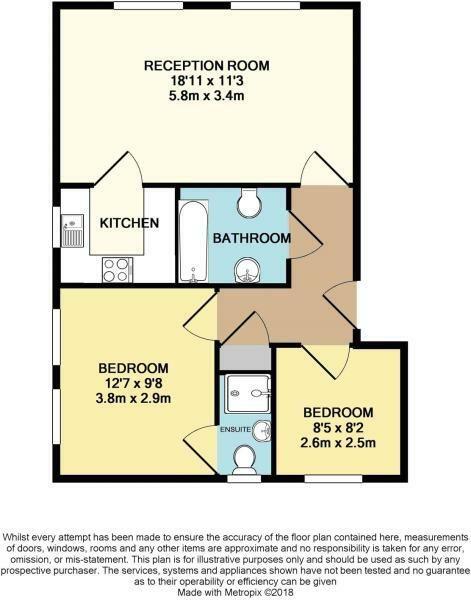 It has double glazing, central heating and an allocated parking space and communal garden area. Offers Invited. KITCHEN: Modern wall and base level units with roll top work surfaces over, integral fridge / freezer, washer / dryer, stainless steel electric cooker with four ring gas hob and extractor hood over, double glazed windows to side aspect. FAMILY BATHROOM: Modern white suite with panelled bath with shower over, pedestal wash basin, close coupled WC, fully tiled, extractor fan, chrome heated towel rail. EN-SUITE: Shower cubicle, close coupled WC, wash basin, fully tiled, double glazed window to rear aspect, heated chrome towel rail. BEDROOM TWO: Double glazed window to rear aspect, radiator. OUTSIDE: Allocated parking space for one car, communal garden area. 2018-2019 is higher as decorating all the communal areas so will be ¿815 for this year.